The school year over, and meetings to plan for the next year completed, I still had twelve days to fill before my flight home. So, of course, Bob and I decided to travel. We rented a car and headed northwest into our current favourite country - la belle France. A natural stone bridge adds interest to this scene in Lods. 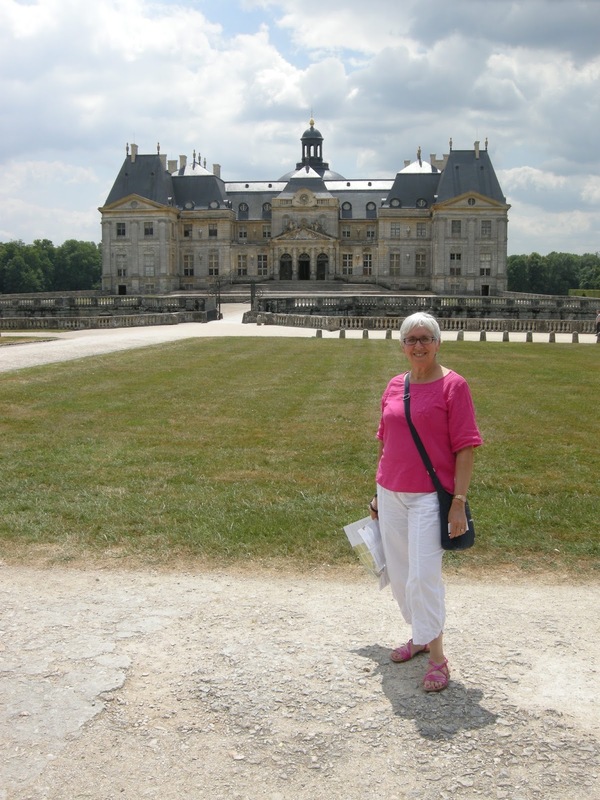 Bob had done some research on a site called "Les Plus Belles Villages de France", so our first stop was one of these, Lods. 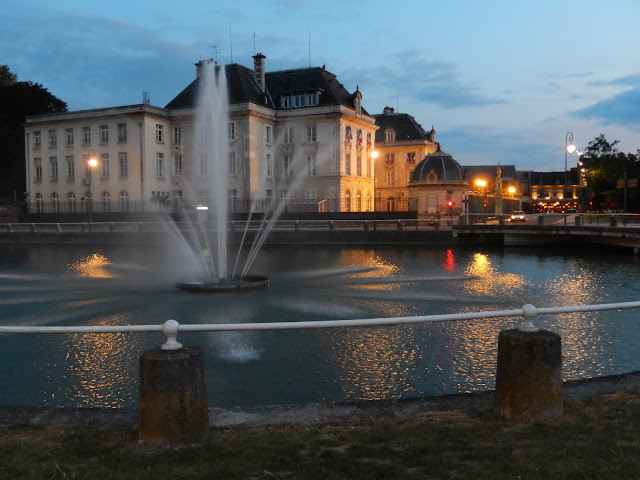 This tiny place lies on the Loue river, near a waterfall. The fire grew from this. The difficulty of putting out this fire. 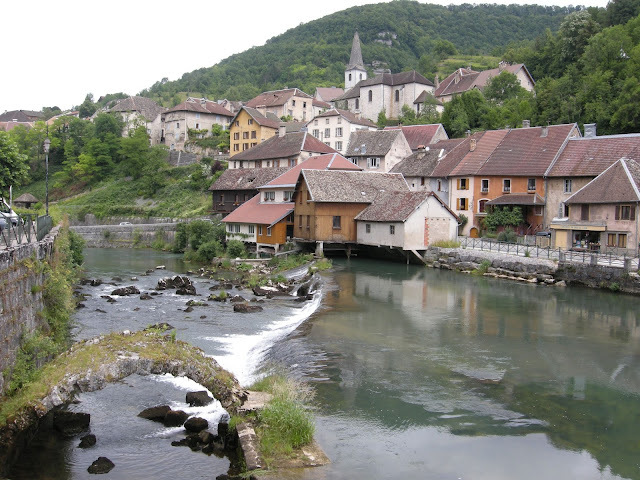 A little further along the road, we stopped at Ornans, with the intention of taking a walk around the town. Unfortunately, our arrival coincided with a local disaster: a fire had erupted in the upper story of a riverside home. It was alarming to watch it spread, and even though we stood some distance away, to feel the heat of the flames. 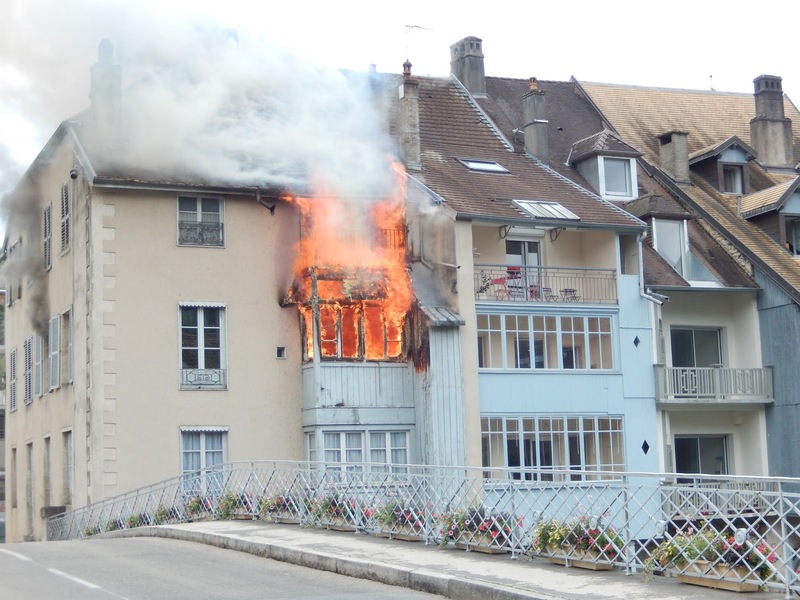 Fire crews arrived from various directions but they struggled to contain the blaze since the building faced the water and it was difficult to get close. 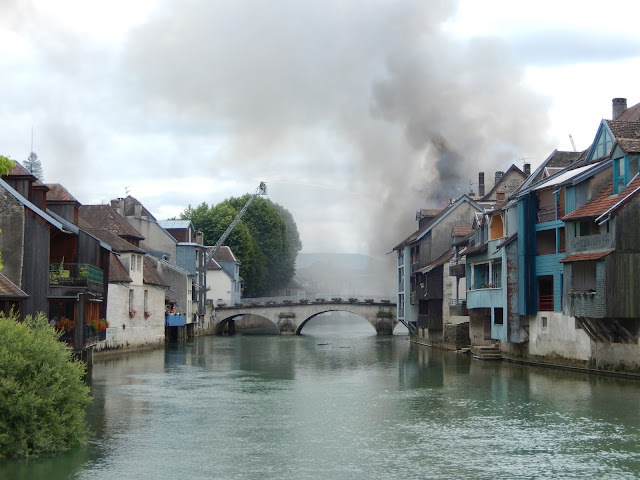 Needless to say, our plan in Ornans was changed by this sad event. Some consolation: the next morning I found a news article online which indicated that the fire had been contained, and that no lives had been lost. Denis Diderot looks over the town of his birth. 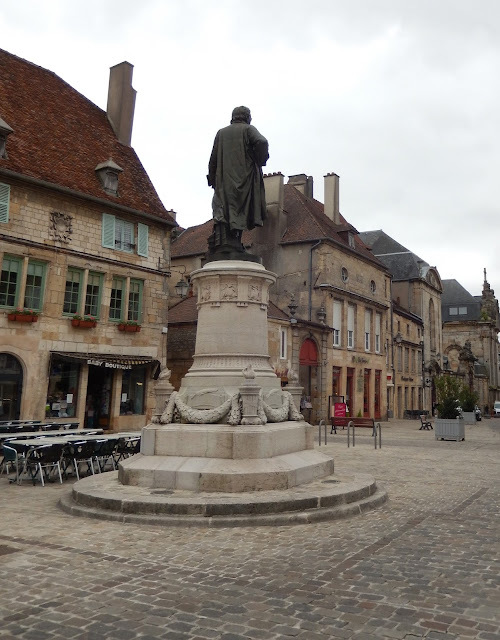 Langres was our next stop, a walled town northwest of Besançon. It is noted as the birthplace of Denis Diderot, a philosopher famous in France for creating the first encyclopedia. 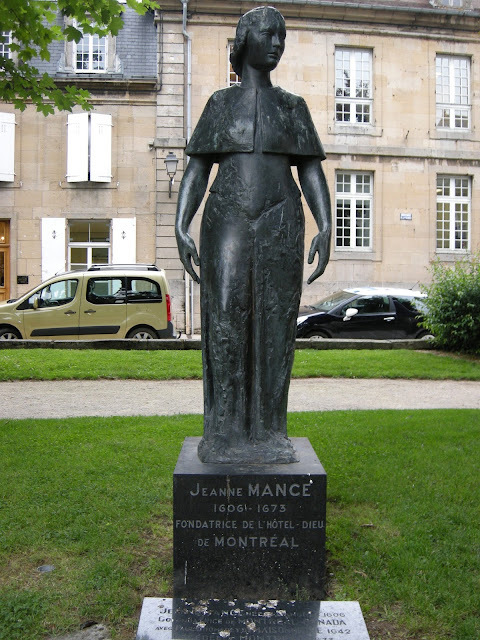 We were pleased to see that it was also the birthplace of a famous Canadian, Jeanne Mance, the founder of the first hospital in New France. 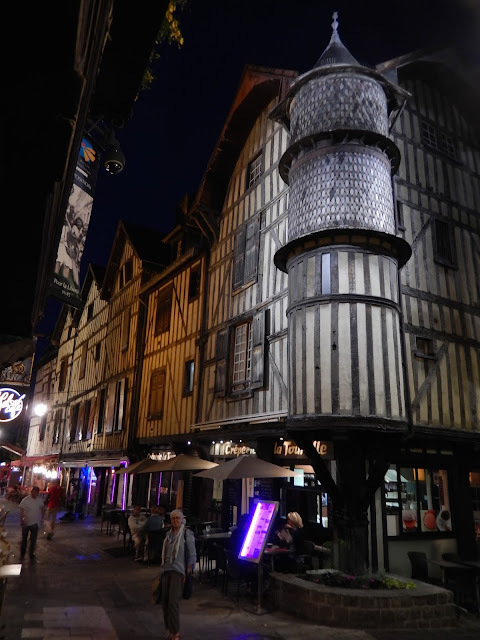 We stopped for the night in Troyes. Although we had stayed there last summer, it was well worth a second look. I loved it even more this time around. Walking its streets after dark is delightful, since many of the important sites are lit up, showing off their beauty. We came upon a plaque to another famous Canadian pioneer, Marguerite Bourgeoys, founder of a congregation of nuns. This was a day to celebrate the women of New France. 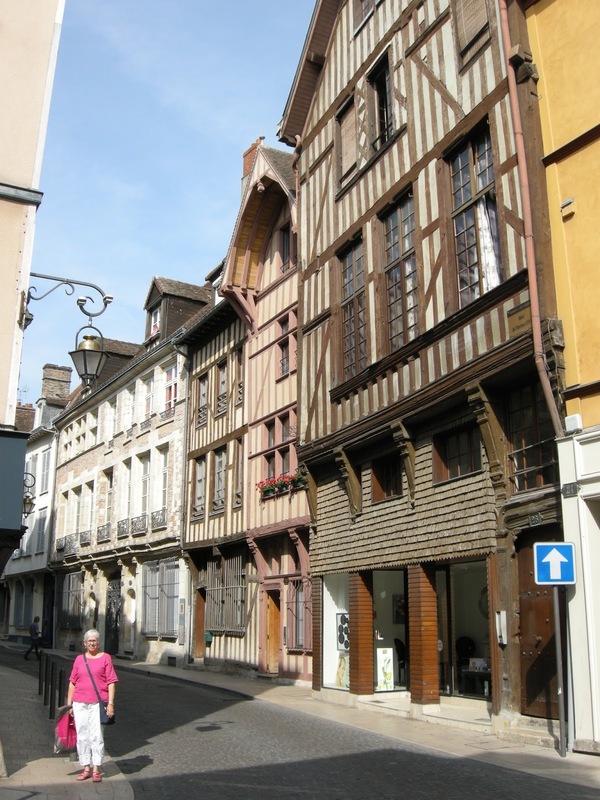 In the daylight, Troyes is even more stunning, however. It has a long and interesting history, too, and has particular importance in Jewish culture. 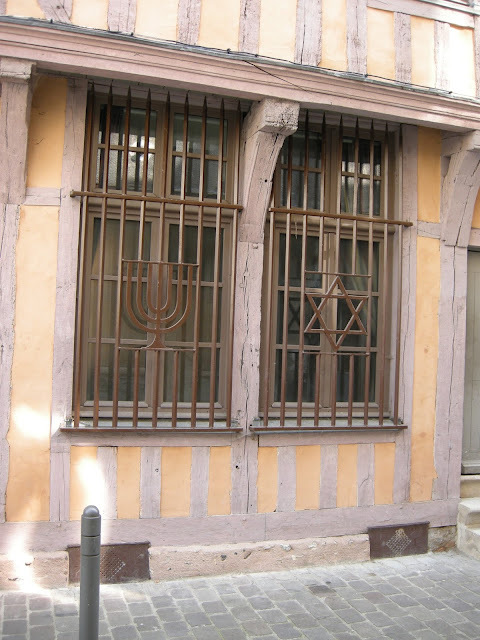 We walked along a street with an old synagogue on it, and saw signs of the current French reality – armed soldiers protecting the neighbourhood. 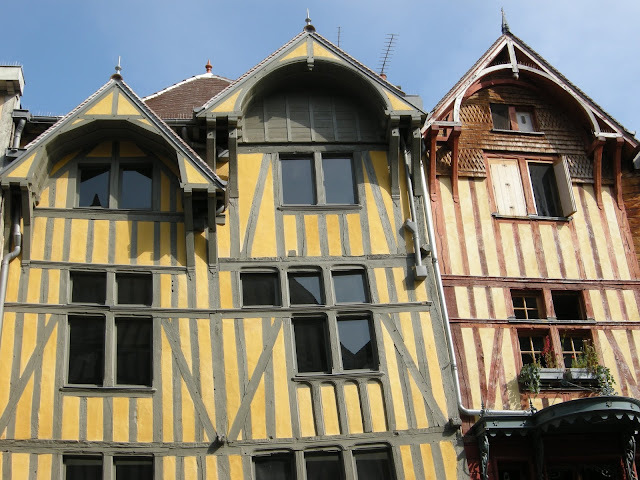 Troyes' heyday occurred during the Renaissance, when after a fire, much of it was rebuilt. 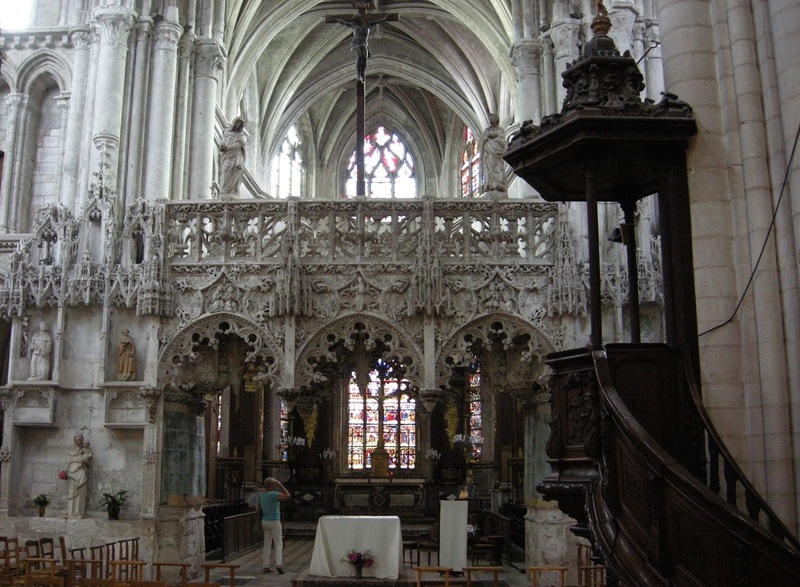 Its importance can be seen in the many beautiful churches in the city, none of which was damaged in the recent wars. 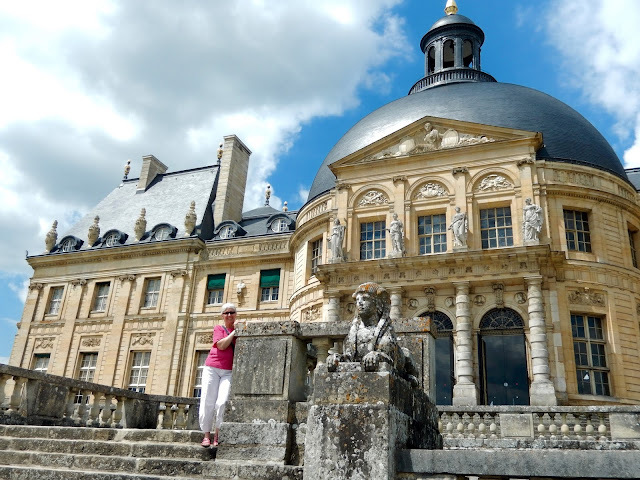 We loved exploring the old city, so much so that we decided to forego a trip to the outlet malls on its outskirts which are a strong draw to the modern tourist. Flamboyant gothic jube in Sainte-Madeleine church. This was a particularly beautiful day, perfect weather to visit a great château. We chose Vaux-le-Vicomte over nearby Fontainebleau on Dan's recommendation. We were very glad we did! It was absolutely stunning. 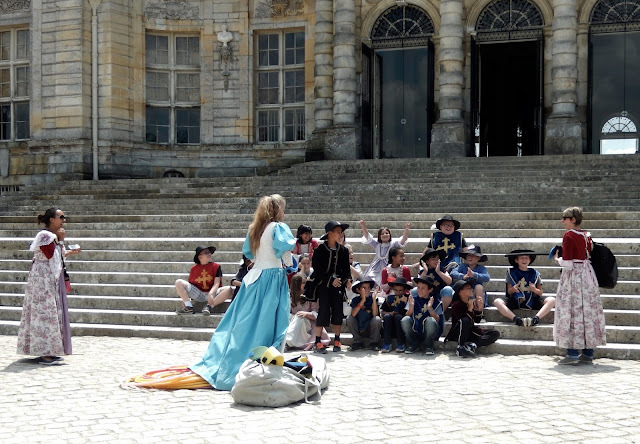 School groups dress in period costumes learn swordmanship here. Nicolas Fouquet, once the supervisor of finances for Louis XIV, had this magnificent house built between 1658 and 1661. 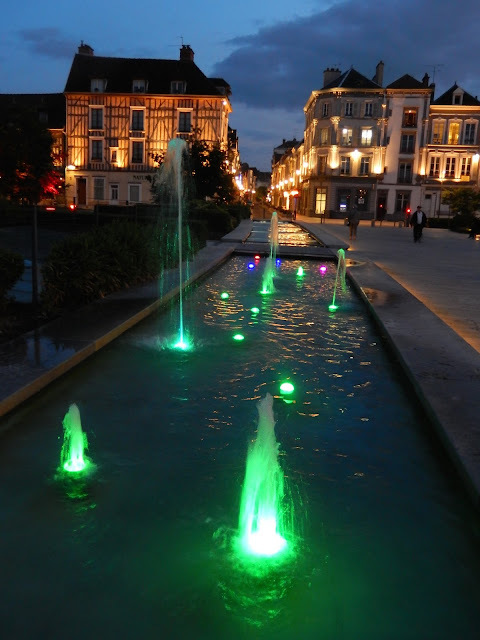 The very best architect, landscape designer and interior designer in France worked on the project. 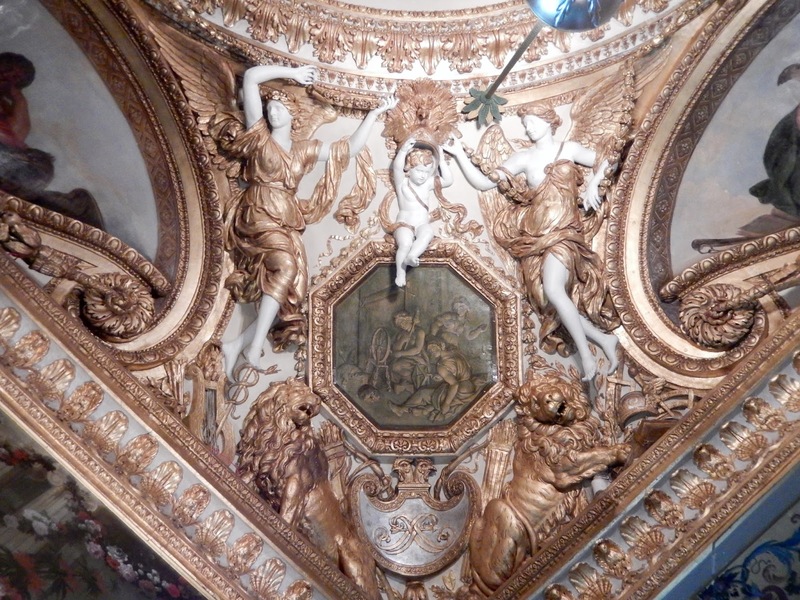 In the first year after its completion, Fouquet organized a fête to which he invited the young King Louis XIV, and where Molière debuted one of his plays. The event backfired horribly for the host. 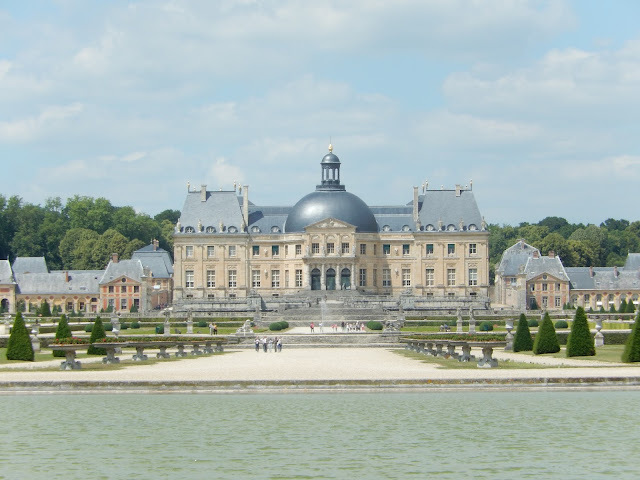 Jealous of the sumptuous château and influenced by the ambitious Jean-Baptiste Colbert, Louis had his financial advisor arrested and imprisoned for life. 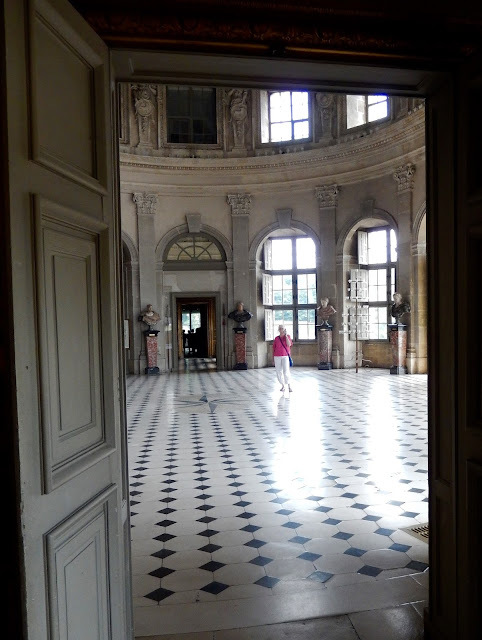 This magnificent hall faces the gardens. It is adorned by busts of Roman emperors. 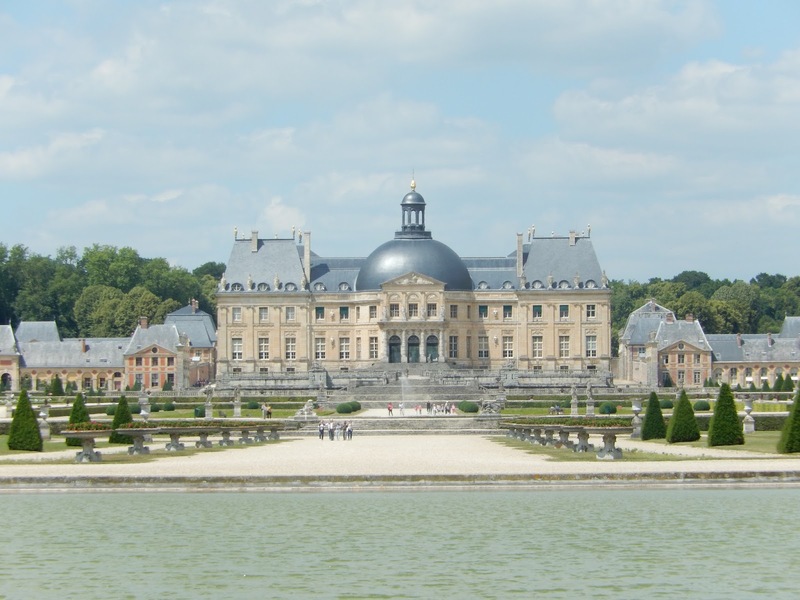 The king confiscated many of the art pieces in the house and then hired the same three men to design Versailles for him. What a story!! 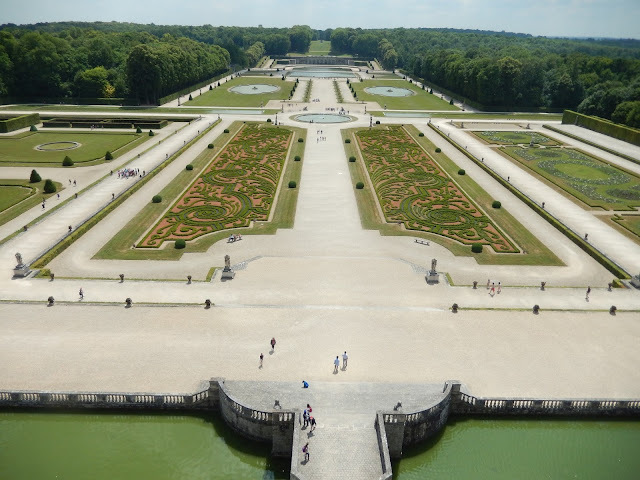 Fortunately, Vaux-le-Vicomte still stands today and has been restored to its original glory by the Sommier family. It took us many hours to explore this site, but eventually we were back on the road, heading northeast this time. More on the trip in the next blog post. 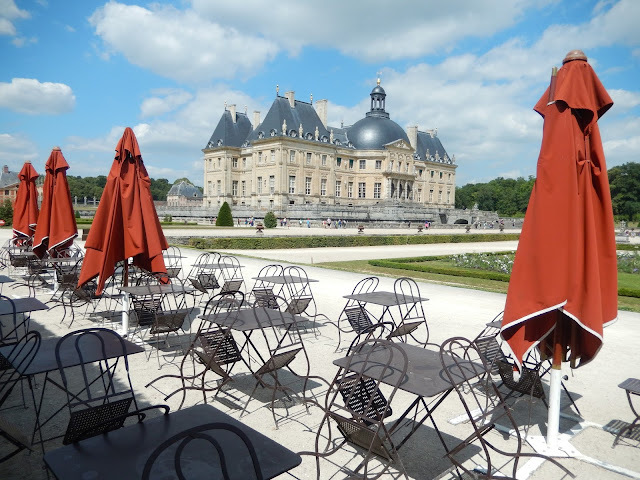 I love this creative view of the château from a small cafe on its grounds - seeing the world through Bob's eyes.